Eggplant does not yield very nicely to a vegetable peeler, julienne or otherwise. It's easier to slice with a knife, though, than either zucchini or summer squash, I guess because it's not as slippery. As for quinoa gratin, I use zucchini-sized and -shaped eggplant for this rather than giant globe eggplant. Eggplant seems to go especially well with tomatoes, so I threw some in. Heat oven to 200-300 degrees. Wash and trim the eggplant, halve it lengthwise and then thinly slice it lengthwise again. Then julienne the slices into noodles. Halve the tomatoes. Saute the eggplant and tomatoes over medium high heat in a bit of olive oil until the noodles are separate and floppy. Put the eggplant and tomatoes on an ovenproof plate, sprinkle with parmesan, and put the plate in the oven while you fry your eggs. Fry the eggs in a bit more olive oil also over medium high heat. I crack my eggs in the oil, let them set a bit, then dribble in a little water from the kettle and cover the skillet for a couple minutes; this cooks the tops of the eggs without having to flip them or wait forever. 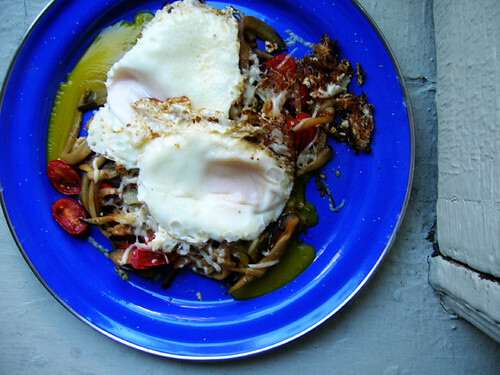 Plate the eggs on top of the eggplant and tomatoes.